When I was at college and University I used to buy the most outrageous outfits from antique fairs, vintage stores and charity shops. At one point I had an original 1960′s baton twirler uniform which I wore to clubs on the regular. My wardrobe was simply overflowing with an array of rainbow coloured clothes…or perhaps costumes is a better way to describe them! Although it was so much fun to wear a new era everyday, I now consider the longevity of a piece when I make my purchases and only pick things that I absolutely adore.There is something really satisfying about having a wardrobe containing a small number of things that you cherish rather than heaps of different stuff that you may only wear once. Rather than shopping exclusively vintage (or exclusively any style) I now prefer to mix all different things together, from luxury, well crafted pieces to unusual vintage finds and funky high-street items. The look in this post combines all three of those categories giving a little nod to the flower power of the 1970′s. Vintage: These bright bakelite bangles were popular in the 1930′s. Bakelite was an early form of plastic and was a popular material for jewelry due to the bright colours available and a more affordable pricepoint than diamonds or gold (as there was little costume jewelry available). They have since become collectors items. There are lots of current styles that have been modeled on this style such as this square bangle by Mikey and this set of bangles by TopShop. Luxury: CRU kindly sent me this beautiful ‘Old Nichol Backpack’. I could tell as soon as I unwrapped the big red parcel that I would cherish it forever. Hours of traditional craftsmanship have gone into the making of this piece and the luxury leather is fully lined with suede. It was designed in London then handcrafted, stitch-by-stitch and seam-by-seam by a small workshop of skilled Artisans in Portugal. The leather will change and develop character as it ages, like a fine wine. It is great for city break adventures. 20% Discount For LedByLucy Readers: The team at CRU are offering LedByLucy readers a special 20% discount off all orders, simply enter CRU15LBL20 when you reach the final stage of the checkout process. Be sure to check out the Rivington Tote bag too, another favourite of mine. High Street: Before purchasing anything pause for a moment and ask yourself: will it last (both style wise and in design), can I think of five or more occasions where I could realistically wear it and do I LOVE it? Oh hello! 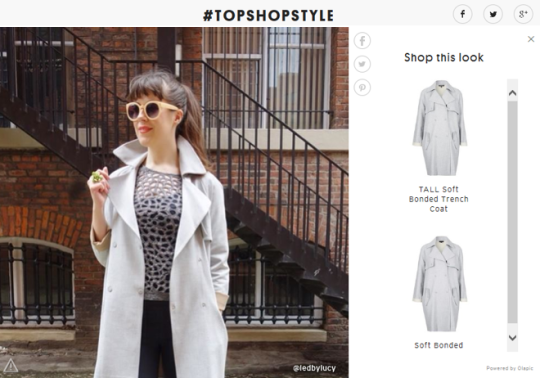 Here I am in my new spring mac on the TopShop style website. To see more photographs of this outfit follow the link to my Mother’s Day Outfit post. This weekend couldn’t have come soon enough. My friend was visiting from London and I was so excited to see her! After our girl’s day out I met my boyfriend at Grill on The Alley for steak, frites and wine. Trips away are lovely but sometimes it’s satisfying to act like a tourist in your own city, this weekend I gave it a whirl with a little bit of fairground fashion. We went boating on the lake in our local park and I pretended we were in the notebook (obvs). Then we went the the fairground and won some tat that we don’t need and donated it to cute kiddies on the way home. I went dancing in the gay village too and saw friends from college. It was so much fun to re-discover places that have been sitting right under my nose all along. Handbag: Starburst reversible tote in coral and silver from Echo Designs. I LOVE this and will be taking it everywhere with me this summer. It is lightweight, foldable and matches just about everything (fab for holiday hand luggage). The coral colour was a little to orangey to go with my red skirt today but the silver side was perfect. comfortable. Find a similar striped top here. Usually, from the moment a city break is booked the dreaming begins. I gather together gems of advice and compose a wish lists of things to do. This trip to Paris came as a fantastic surprise from Nick for Christmas. He did everything from selecting the apartment on Airbnb to secretly booking my time off work. I was so giddy with excitement when I found out and he scored some serious boyfriend points! As everything was already planned (and our schedules have been a little hectic recently) we didn’t give the trip another thought until it was time to pack our bags. No long lists of recommendations, just the hope of a happy holiday! On the plane journey over there we devised an elaborate plan for our first afternoon in The City Of Love: check out apartment then drink red wine and eat French food! Down the cobbled street and up the spiral staircase we went to meet Thierry, the keeper of the keys and the apartment owner’s boyfriend. Imagine an illustration of a French artist, that is exactly how he looked with his aged but handsome features, long messy hair, crumpled suit and flouncy neck scarf. I so wanted to take a photograph of him but doubt got the better of me, sometimes bohemians don’t want to be papped for the purpose of your blog. The apartment was stunning with huge sash windows, original wooden floors and a bright orange Smeg fridge. The beauty of traveling with Airbnb is that each rental is unique and usually represents the owner’s tastes and lifestyle requirements. Some are purely rentals with minimal decor but this one was the home of an artist with chipped paint on the walls and original paintings hung in every room. That was the first thing on the to do list done, on to the second and third: wine plus food! We headed into Marais for a bottle of red wine, onion soup (wow- I need to learn how to make it) and potato salad. Marais is one of my favourite areas in Paris, it reminds me a little of Soho in London. It has a cool vibe with lots of contemporary art galleries, independent restaurants and quirky bars. Satisfied that we had tackled our epic to-do list we took an evening stroll along Canal St Martin to see some sights. When we arrived back at our apartment we discovered that you could actually see the Eiffel tower sparkling in the darkness through the spare bedroom window. It was pretty magical. I love traveling with Airbnb, you just never know what you might discover!